On the front lines of a heroin epidemic, local firefighters are experiencing a scary new normal. Some fire stations are responding to dozens of overdose calls a day. The fear is that if the epidemic gets any worse, some departments will not be able to keep up. 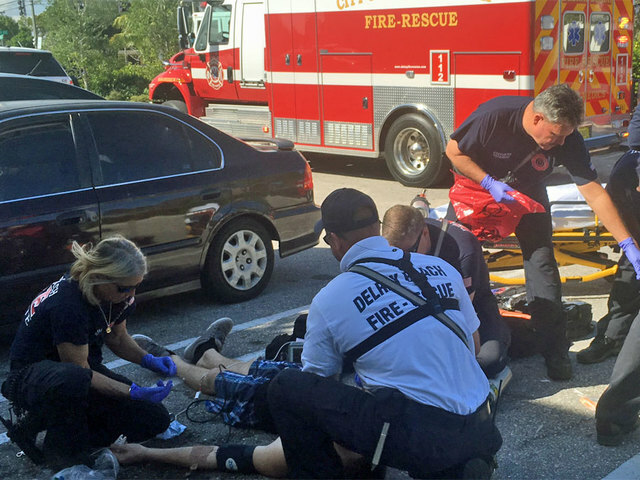 For Delray Beach firefighters it’s not difficult to tell when a deadly batch of heroin has hit the streets. The overdose calls start coming in; some as overdose intoxication, others come in as cardiac arrest or trouble breathing. The common denominator is that the patients are all in their 20s or 30s. Narcan is the opiate antidote, but it’s not working like it used to. “What we used to administer at .4 milligrams of Narcan, now we're administering up to 8 and sometimes even more,” said Fire Chief Neal de Jesus, Delray Beach Fire Rescue. Today’s heroin is laced with fentanyl, a synthetic opioid 50 times stronger than morphine. That’s the killer. Even with Narcan, Fire Chief de Jesus says his first responders can’t save them all. “They’re seeing an amount of deaths equal to what we used to see in a career, they are now seeing in over a several months span,” added Chief de Jesus. And in many situations, while first responders are helping one overdose patient, there’s another 911 call coming in. Another overdose. Already this year, Delray Beach firefighters have administered Narcan 1603 times. There have been 47 heroin overdose deaths in 2016 just in Delray Beach alone. During a two-day ride along with Delray Beach fire rescue, we witnessed first responders help a user who dropped his heroin on the ground of a public parking lot. Another time, they discovered needles and a spoon on top of a restaurant bathroom sink. What hit us the hardest? A 3-year-old boy who found father unconscious inside of a business’ bathroom. He told the owner his daddy was sleeping. “There’s been occasions where they've responded back to that same patient for another overdose twice and in one case 3 times in the same day and that's incredibly frustrating,” added Chief de Jesus. Chief de Jesus says this is the worst he’s seen drug use in his 32 years of fire rescue service. Firefighters in his department are now going through mandatory counseling. “The signs and symptoms that I've seen in firefighters in just becoming callous and hardened to here is another overdose and here is another person who is willingly and voluntarily trying to take their life for a high,” added de Jesus. Chief de Jesus has asked the city to approve 24 hires over the next three years. The hiring process has already begun. “Next month we will be staffed at three personnel on a rescue truck instead of two in two of our stations and two additional rescues for the following two years until all our rescues are staffed at three,” said Chief de Jesus. The manpower will help with the growing number of calls, but the fire chief believes more regulation is needed for sober homes.